The Burleigh01485 533080work Guest HouseA charming, family-run guesthouse in the quieter part of Hunstanton, two minutes from the town centre and sea front. Conveniently situated for the nearby RSPB reserves. Large, comfortable rooms, most with sea views, are generously equipped with lots of extra little luxuries. Digital television and DAB radio now available in all rooms. A superb breakfast using locally sourced East Anglian produce can be enjoyed in the large and airy dining room. Take advantage of the residents bar and relax in our cosy lounge or soak up the excellent sea views from our award winning sunny patio. Best of all we offer our renowned friendly and personal service. We are committed to providing the highest quality at a competitive price with an emphasis on fair trade and local products. 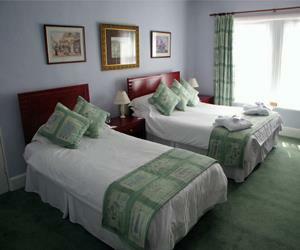 A charming, family-run guesthouse in the quieter part of Hunstanton, two minutes from the town centre and sea front. Conveniently situated for the nearby RSPB reserves. We welcome bookings from birding and walking groups. Cycle storage available. Children welcome from age 5. From Kings Lynn, take the A149 to Hunstanton. At first roundabout take second exit to South Beach. At second roundabout take third exit. At the T junction bear left, where the road bends to the right, take left fork to Cliff Parade, first right to Cliff Terrace. Burleigh is on the left.